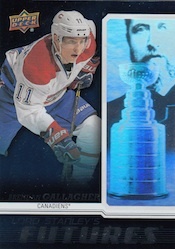 The double-rookie class should make 2013-14 hockey card products some of the best in recent memory. 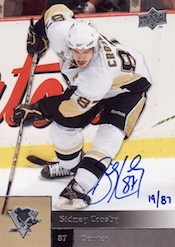 And with that, 2013-14 Upper Deck Series 1 Hockey is one of the biggest. Delivering sharp photography throughout, an impressive crop of Young Guns rookie cards and plenty of other inserts and angles -- there are plenty of reasons why this is one of the most popular brands in the entire hobby. 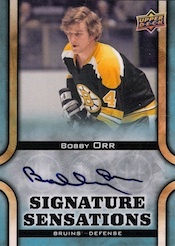 The 2013-14 Upper Deck Series 1 Hockey base set has 200 base cards. Adding to that are 50 Young Guns rookie cards finish off the set. Among the most dependable and widely collected rookie cards each year, Young Guns are moderate short prints. They combine to fall 1:4 packs, or six per hobby box. 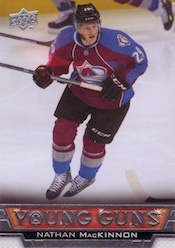 The checklist is filled with first-year standouts from 2012-13 such as Nail Yakupov and Alex Galchenyuk as well as high-profile 2013-14 rookies like Nathan MacKinnon and Seth Jones. Exclusive parallels return, falling six per case. UD Canvas cards return as well, landing four per box. 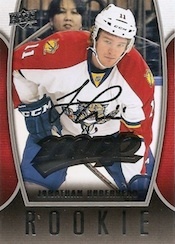 The focus of 2013-14 Upper Deck Series 1 Hockey isn't so much on autographs and memorabilia cards, but they're still here. Hobby boxes have a pair of jersey cards. These have rare patch parallel versions. Signature Sensations bring the ink at a rate of approximately one per hobby case. 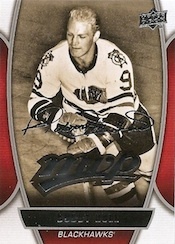 Basic inserts in 2013-14 Upper Deck Series 1 Hockey include Hockey Heroes 1980's (1:12 packs) and Shining Stars (1:12 packs). Clear Cut returns as a case hit. These cards use die-cut acetate designs. The MVP brand lives on. The set-within-a-set drops at a rate of five per box including one MVP Roookie Card. MVP cards have Script parallels. 2013-14 Upper Deck Series 1 Hockey Complete 200 Card Base Set NO SP YOUNG GUNS! Featuring 200 cards. Shop for base sets (#1-200) or full sets with Young Guns (#1-250) on eBay. Featuring 50 cards. Click here for a detailed look at all of the Young Guns. Featuring 18 cards. Click here for a complete look at the set. Only 200 base cards??? At least your not cutting off part of the picture this year with the name or a bar going across. 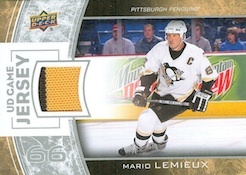 Most overrated hockey cards of all time. Young guns 4per box how about 1 per case like the autos,then the chase would be on.Patch cards that you can’t even sell.hockey heros ? Need I say more. I couldn’t sell any besides Orr,Gretzky,maybe crosby . 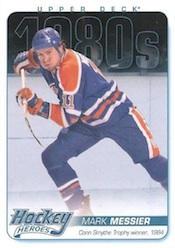 Why is Lindros even considered,never played always hurt. UD rips you off again year after year after year. Have you seen what Young Guns of key players sell for? Considering they’re not autographed, not numbered and relatively easy to assemble a set of, they move very well. Compare them to rookies from other sets and sports at a similar price point. This isn’t a high-end brand. It’s like a slightly more upscale base brand. Not every box is going to give the “big mojo hits” but I’d say it’s not supposed to. I just wanted to chime in on Billdavis’ statement. I have to assume you are a card dealer who’s only interest is selling for huge profits. I’m not. I don’t collect like I used to, but I always try to buy a box or 2 of this stuff. It’s affordable, and you might get a few rc’s that prove valuable. Maybe you can pass ’em down to your kids someday. I don’t even now if there are and card dealerships in the area anymore. The only places I know of that even sell cards are Target and occasionally Wal-Mart. I can’t even fathom anyone being able to afford a lot of the stuff I see nowadays (like “The Cup”, etc.) The type of product you are talking about, I would never purchase. Anything more than a few bucks for a pack is out of the question. I have a house to pay for, kids to feed, etc. 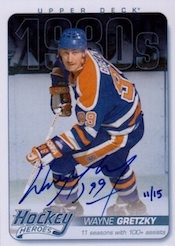 I will never own a certified one of one gretzky auto patch shiny whatever type of thing. If I did, I’d sell it and buy a car, instead. Not everyone wants to spend 1000+$ on a case, and then tries to sell it. Some of us actually “collect” cards, still. Decent but hobby boxes are now overpriced. Make a test. Take all existing products and brake it down in hits, parallel and base cards. Now go on ebay and look for the cost of the same amount of base, parallel and hits. It is now less expensive to just buy singles and sets from ebay than buying multiple hobby boxes and getting the same multiple base card over and over again. This is caused by hobby stores opening boxes at 60% of retail price and selling them on ebay. They don’t realize that they are actually hurting their business. cause once everyone realize what I just explained the hobby store market will die…..
Eric � Some products don’t offer better value than others. The thrill of the chase is what drives many collectors, the potential for something big. Other collectors, myself include, open a box for the enjoyment. Not every collector is into collecting for the money. Do I buy singles too? Sure. Very often, in fact. But some products are fun to open even when you wouldn’t get what you paid for them. Your going about it wrong if buying boxes retail and expecting to make money at it. Sure some boxes will pay off, but most won’t break even. Like other said, there is a rush opening cards and I see it as no different than gambling a 100 bucks at a casino or 75 dollar concert ticket, You do it cause its a rush and something you enjoy. I buy a few boxes that have decent rookies chances and go from there. I like collecting rookies. If you are buying boxes just for making money it is always wrong. I hate the card business nowadays because people only think “how much I am going to make money”. It is quite far from collecting. And the card companies have also chosen the same way. The boxes have lots of little numbered cards and fewer cards with same price. Collecting in 90es when I started was lot better and lot more fun. I bought two hobby boxes of this product. 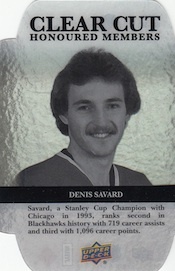 I found that all 12 of my Young Guns had creases on the back of the cards. Not impressed. It’s almost seems UD was more concerned about getting the product out and not what kind of quality it was. I see what Chris said, I had same problem. 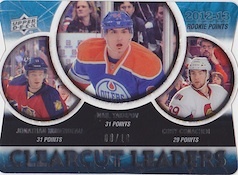 All 6 of my young guns had a completely visable crease through the orange part of back of card! Maybe I was not clear. I don’t buy boxes to make money. What I meant is rather than buying hobby boxes it’s better just to go on ebay and buy singles. This makes me sad cause I also like opening boxes but the difference in the price today makes it not worth the money just for that rush. If I really want to gamble I’ll go with the ultimate rush and gamble for real. So what Im trying to say is 1) Boxes are more expensive than resell and 2) 100$ is not worth the small rush of opening them. But I also respect everyone who do like to pay that much. More of the same. UD had a ton of time to prep a better Series 1. 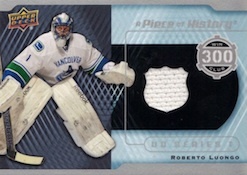 I collect goalies – use Set 1 to get the starters out of the way, Use Set 2 to cover backups, trades etc. I only glanced but Smith, Niemi, Hiller, Rask, Price, Ward, Rinne, Nabokov and Howard should be here too. Fasth was more than deserving for Young Guns Status. I prefer that to taking a flyer on a guy that may never play in th eNHL (Hunwick, Hutchinson etc as in years past). I did not run into the crease problem on the back of the YG cards that Chris and Jeremy described, but I did encounter that on the back of some Artifacts cards this year. Is there any recourse with Upper Deck when that happens? Coach Krusty � They should replace them if you send them in with a note explaining the issue. First, let me say that this site is awesome! The BEST card site on the net by far. Thank you. 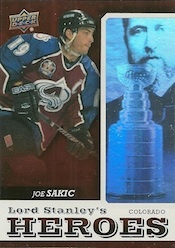 I don’t collect hockey cards too much but have been collecting sports cards since the late 70’s. I got sucked into the hype of the double rookie class on this one. 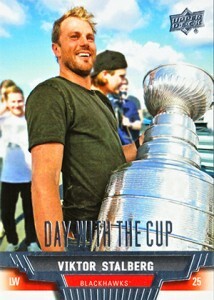 And got sucked into the fact that “hockey guys” love this product for the young guns every year. So I bought a whole case. I have to say that this is one of the worst products I have ever bought. It reminds me of the over produced 90’s crap. It is on the low to mid end but it just looks and feels very cheap. There was no attention to detail at all. Who the heck are the quality control people? They need to be fired! Every fourth card is either creased or dinged on the top left or center. My case did not have one single relic card in it. The packs that were suppose to have them just had the 5 base cards and the relic card missing Thank goodness for my local card store in helping me out and contacting UD so they can send me those relics. The other thing that really made me mad was the autograph card I got. Yes, ONE auto card in a case!! You would think that with those kind of odds, that they would only have the best of the best signing autographs on card. Nope. I get an absolute no name from Chicago on a sticker. That is hard to do since Chicago has a lot of good players. To top that off, the card has two dings on the top! The other “one card per case” inserts were not any better. Pure trash! There are a couple of good things. The photo’s are awesome! It really made you look at these cards more carefully. 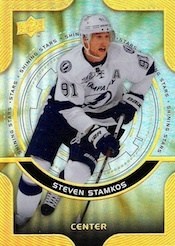 It took a case but the coalition of the young guns and couple other inserts were good enough where I finished the sets. Other then that, I did not see anything that was good about this product. After opening this case, the first case I have ever opening, I felt soooo cheated. I was absolutely disgusted by the whole product! There aren’t many times in my life where I felt like I really wasted my money but this product really did make me feel that way. Sorry to be long winded but UD series 1 was so bad that it forced me to come in here and write about it. David � Yikes! Glad you were able to get in contact with UD. If there were no relics, something was definitely messed up. With so many dinged base cards, you should be talking to them about that as well. Overall I like this set. I like that it’s cheap and the big hits are there (few and far between though). I’m not a fan of the high end packs that have a hit in every pack, too much of that in recent years has made it spoil the fun of opening packs, for me anyway. I’ve bought 5 boxes and pulled one auto, a UD Canvas Jordan Eberle auto #/14. I also pulled a clear cut foundations #/25 and a few exclusives #/100. Going to get 4 or 5 more boxes today. I have purchased four of the Tins with 12 packs thus far. 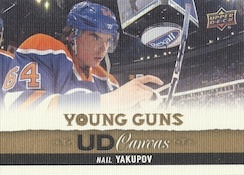 The first Tin yielded four packs that were over stuffed with Young Guns cards and I ended up with 25 Young Guns. Was this a factory error, or are there hot packs? The chase was then on. The second Tin yielded an Eric Lindros SSP Flyers Jersey card, so still not too bad. Tins three and four, not much to rant and rave about… only hit doubles of the same Young Guns and no Jerseys. Collation is so so. Thinking of trying some blaster boxes to try to get some different Young Guns to fill my set. The Mackinnon Young Guns seems elusive, and of course the highest priced on on the secondary market… although at this point I would like to complete the set. Hobby boxes are probably the way to go if you are looking to score some more good “hits”, (although I have not ventured there ye)t.
Fantastic! Can’t wait to buy! I bought 2 more boxes this past Friday and I was very disappointed. I didn’t pull even 1 game jersey (there should have been 4 total) from either box, only 9 Young Guns and to top it off there were multiple packs that only had 5 cards instead of 8 and none had inserts at all. I emailed UD to let them know, I’ll post again when I hear a response from them. IF I hear a response.. I am new to card collecting but have started with UD series one and have been enjoying it. My question is is series 2 as popular as series 1? Why do they do a second series? Thanks for helping out a new collector. Tyson � Series 1 is often more popular, but Series 2 is still one of the bigger hockey products of the year. It’s similar to Topps with baseball — a second set helps fill the checklist with more rookies and traded players. It also puts some padding and time between releases rather than putting out one monster set. This would probably put some people off as putting it together might be too daunting. Ultimately, it’s about sales. A second set is profitable so it gets done every year (except 2012-13 because of the labor dispute). I had to lower my previous rating. Since my last post, I have purchased 5 tins and one hobby box. My hobby box, all 6 YG had creases on the backs. With the tins, I have putted two YG Canvas cards. Both of them had tears on the front of the cards. Also, many cards are off centre. You can see the next card just on the edge of the card. I’ve had great luck with their Artifacts and Team Canada products…but this product has been a completed disaster. I bought four hobby boxes today. 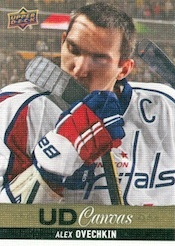 In the final box approximately half of the base cards had no silver foil around the name at the bottom and no upper deck logo on the face of the card. There does not appear to be any difference on the back of the card. Did I get a defective batch? Are these worth anything? I have bought 6 boxes this yr and I have pulled 6 yakupovs,mackinnon,hertl x2,schultz x2 schultz young gun canvas, mvp gold script /100 Crosby and bobby hull and one BIGGGGGGG pull galchenyuk high gloss young /10 it is on ebay right now and it is at $370 so people this yrs product is far better then last 3 yrs not since 2010 with hall,eberle,subban etc has this product been so good. I like those 2013-14 shining stars cards. Does anyone knows why most pictures of if seems sylver in stead of gold? I said I’d post again when I find out what Upper Deck was going to do to “fix” the multiple boxes I bought that had nothing but base and yg in them. After 1 1/2 months I received a package via Fedex last Friday and without going into detail, I was pleased. I got quite a few singles from Series 1, all either canvas yg yg, autos, game jerseys, DWTC, and exclusives along with a few packs of SPA. Two thumbs up to UD for making their mistake right! 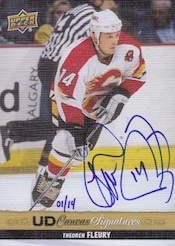 Just opened a hobby box and pulled a MacKinnon Young Gun, Adam Oates clear cut as my top 2 cards. As a student with a limited budget, I strongly believe that the Upper Deck series 1 is a great product for what you pay for and the amount cards and value you get out of it. I opened 2 hobby boxes and a couple of thin cans and I have 30 YG including Galenchenyuk, Tarasenkon, Yakupov, Monahan, Dumba, Huberdeau, Soderberg, Pageau and more. I just started collecting again because my son was interested. I bought 1 hobby box and it was loaded with good cards including Duncan Keith UD game patch #12/15. I’m hooked again ! I think this ud set is great my son loves it. I’ve already got a seth jones. 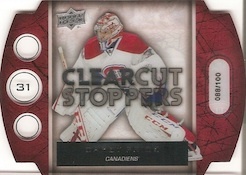 We have seen this card for 25$.Would we be able to trade this card for another box ?? great fun! Pulled an nice tomas hertl rookie card! This is an very decent series. For the Rookie Collector I would Recommend it any day. I profit off of HIGH END boxes, NOT series 1 boxes. I buy the SERIES 1 for the Young Guns and so should you. The double rookie class makes it worth it. Is there going to be a dead box here and there? Absolutely, it’s a gamble. I will give you the hits of the first box and you can compare them to the box checklist above. -5 MVP – Toews, Bure, Duchene, Lundqvist and Rookie Peter Mrazek. 1 More hit than I was suppose to in the 7th Young Gun. I clearly got lucky hitting the Mackinnon (50$-120$ graded online). These boxes are great if you buy the whole box. You will get your hits and be happy with at least a couple of them. You cannot post about none profit on a series 1/2 box if you know what you are doing, therefor I chalk it up to ignorance and lack of experience. Sorry for the long winded post, I figure I can set the record straight and give you a non bias answer as I collect low to high end and have been for 20 years. I have sold hits and done live box breaks for 5. Buy high end to have a CHANCE at profit. Buy low to mid if your in it for the cards. THANK YOU and Hope this helps you buy a box or case. I have bought 3 hobby boxes and have noticed 11 out of 19 Young Gun cards have printing defects. There is a noticeable glossy imperfections causing a line. It looks like creases. 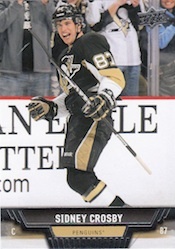 These are on the back of the Young Gun cards. Although this is part of the hobby but it is discouraging. Michael White � I believe this is fairly common. I’ve heard of collectors writing to UD and getting replacements. Typical upper deck worthless junk. ugly one color jerseys usuallk white a few rookies and thats it. I just purchased a tin of series 1 from Walmart and I pulles 46 young guns. Has anyone herd of such a thing. The first tin I opened the oversized card was damaged, one of the packs was already opened, and most of the cards had bad corners. At least I only got it for 20$.